In this photo provided by SpaceX, the SpaceX team in Hawthorne, Calif., watches as the SpaceX Crew Dragon docks with the International Space Station’s Harmony module, Sunday, March 3, 2019. SpaceX's new crew capsule arrived at the International Space Station on Sunday, acing its second milestone in just over a day. SpaceX's sleek, new crew capsule arrived at the International Space Station on Sunday, acing its second milestone in just over a day. No one was aboard the Dragon capsule launched Saturday on its first test flight, only an instrumented dummy. But that quickly changed once the hatch swung open and the space station astronauts floated inside. "A new generation of space flight starts now with the arrival of @SpaceX's Crew Dragon to the @Space_Station," NASA Administrator Jim Bridenstine tweeted. "Congratulations to all for this historic achievement getting us closer to flying American Astronauts on American rockets." 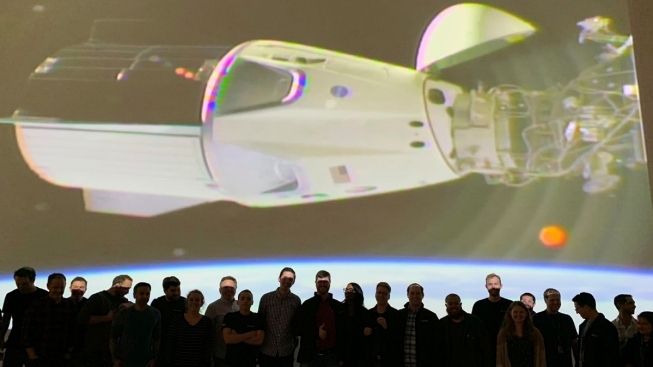 This beefed-up, redesigned Dragon is the first American-made, designed-for-crew spacecraft to pull up to the station in eight years. The next one coming up will have its own two-man crew. The launch of the Falcon 9 rocket cast a spectacular light over the Southern California sky Sunday evening. The space station's three astronauts had front-row seats as the white 27-foot-long (8-meter-long) capsule neatly docked, a little early no less. TV cameras on Dragon as well as the station provided stunning views of one another throughout the rendezvous. Just two hours after the Dragon's grand entrance, the station crew entered to take air samples. The astronauts wore oxygen masks and hoods until getting the all-clear. While SpaceX has sent plenty of cargo Dragons to the space station, crew Dragon is a different beast. It docked autonomously under the station astronauts' watchful eyes, instead of relying on the station's robot arm for berthing. The capsule's nose cap was wide open like a dragon's mouth, to expose the docking mechanism. Behnken said that's the way it should work when he and Hurley are on board; they may push a button or two and will have the ability to intervene, if necessary. 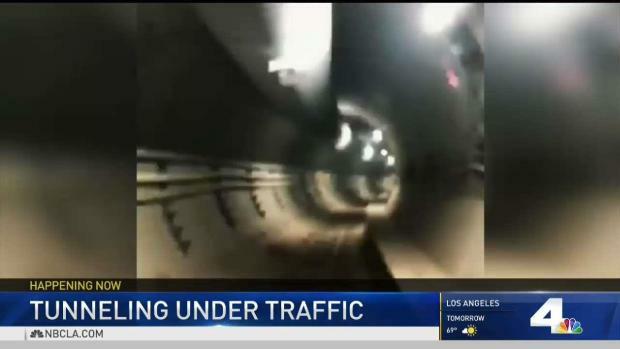 Tesla and SpaceX CEO Elon Musk is one step closer to remedying the harsh Los Angeles traffic with his underground tunnel. Beverly White reports for the NBC4 News at 11 on Thursday, May 10, 2018. The capsule's lone passenger for launch — a mannequin wearing a white SpaceX spacesuit — remained strapped into its seat as the station's U.S., Canadian and Russian crew removed supplies and photographed the spotless white interior. The test dummy — or Smarty as SpaceX likes to call it, given all the instrumentation — is named Ripley after the lead character in the science-fiction "Alien" films. The resupply ship, carrying 4,000 pounds of NASA equipment, left the International Space Station and before splashing down in Baja, California.